Japanese Episode AG 002: "Kodai Pokemon to Nazo no Gundan!" American Episode 274: "A Ruin with a View"
While the second episode of Advanced Generation isn't anything to write home about, it's decent enough at advancing the plot. Haruka tries to get her first pokemon, she visits her first Pokemon Center, a new town is visited, the Magma-Dan show up, and a decision is made to go to the next city. It's a lot better than Jouto, that's for sure. The same thing happened with this episode that happened in the last one--only one piece of music was kept. 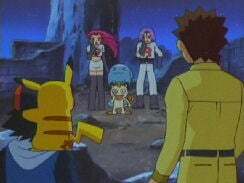 This time, it was the music played during the battle between the Rocket-Dan and Satoshi. I hope Pokémon Advanced doesn't turn into one big game of "let's find the one piece of music that was kept! ", because that's what it looks like right now. While I was less than convinced that May's lines had been redubbed in the last episode (save for the opening scene), I'm certain that her lines were redubbed for this one. I noticed that the pitch seemed to be different, and the way she pronounced the word "pokemon" would vary from version to version, scene to scene. Aside from the pitch, the big tip-off that her lines were redubbed were the lines that were different from the sneak peek version. The first rewrite occurs right after she orders her Torchic to use its Peck attack against the wild Azurill. Sneak Peek: "Over there, Torchic! Oh~! Wait for me!" Regular Version: "Over there, Torchic! No~! Wait for me!" Sneak Peek: "Oh good. Thank you. OK, come out!" Regular Version: "Oh great. Thank you. OK, come out!" Like the first episode, it's nothing major. I think it's great that they let Veronica Taylor go back and redub her first two episodes as May after letting her get used to the character--such a thing is seldomly done. In any case, I'm glad that after this episode, I won't have to compare any more episodes to their sneak peek versions, so that's less work for me. For some reason at the end of the episode there's a small cut. 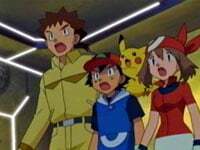 Right before Musashi calls her Arbok to fight Satoshi (after Professor Alden says "Hey! You guys give back those treasures! "), there's a scene of Musashi, Kojirou, and Nyasu doing the bii-da thing. That's when an anime character pulls one eyelid down and sticks out his tongue, and it's basically equivalent to sticking out your tongue in America. 4Kids apparently found that offensive, so they cut it. Maybe they cut it out because they thought it looked too much like the Rocket-Dan flipping the bird? For the sneak peek airing of this episode, 4Kids erased the "TO BE CONTINUED" text from the end of the episode. The text was restored for the regular version.